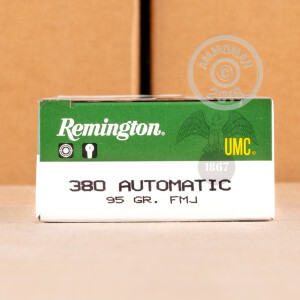 Remington UMC produces quality range ammo at affordable prices at its plant in Arkansas. 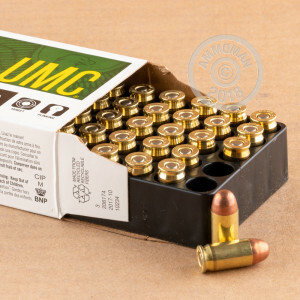 This case of 500 rounds in .380 ACP is ideal for training with your carry pistol such as a Glock 42, Colt Mustang, Ruger LCP, or Walther PP. These rounds use a 95 grain full metal jacket bullet, non-corrosive Boxer primers, and reloadable brass casings. The .380 ACP has been around since 1908, and was designed by John Moses Browning. The round has achieved its greatest popularity in Europe, with a wide variety of European manufacturers including Walther, Glock, Bersa, SIG, and CZ making guns chambered in it. With the rise of concealed carry rights in the US, however, the .380 has been enjoying a resurgence thanks to its compact dimensions. 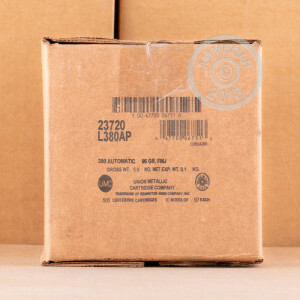 Buy more than $99 worth of rounds from AmmoMan.com and get free shipping direct to your door. I have not been to the range yet,but I have used this brand before and found it to work perfectly. Also the price is fantastic.